NOT all that far from where the Nantwich Salt Ship was found in 2003, more pieces of the town's history have come to light four years later. This time it is a piece of Roman trackway and part of a Medieval causeway. This (right) is the trench crossing the river bridge in Welsh Row during the work. Halfway up the picture you can just see the pipe splitting into three. I am guessing that the diameter of a single pipe would have been too large at the apex of the bridge. As reported in the Nantwich Guardian, the discovery was made by contractors May Gurney who are working to replace the old gas pipes in Welsh Row. One engineer is quoted as saying that their equipment hit something harder than the surrounding soil about two and a half metres down. Leigh Dodd, senior archaeologist for Earthworks Archaeology - the people who also worked on the nearby salt ship site - is quoted as saying that "what appeared to be a wooden pipeway" was found and tests dated it to the 13th century. Digging further down, the archaeologists found a Roman footpath complete with bits of pottery. Said Leigh: "There is a Roman road that is supposed to run by Kingsley Fields . . . that we think must go across Welsh Row." The finds are being dated. And leading up to this in July 2007 . . . 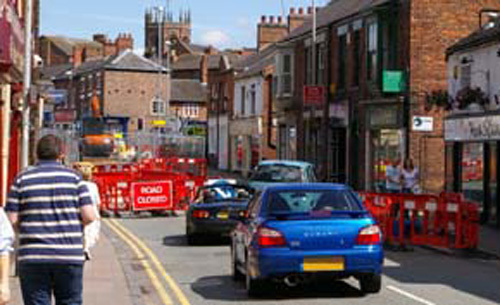 MOTORISTS approaching Nantwich Town Centre from the Welsh Row and Wrenbury (etc) directions have been having to put in some extra mileage with the closure of the River Weaver bridge for the gas pipeline work. There are signs out warning of the closure - sort of (see right). But I am not sure that strangers to the area would think that was the case. For one thing, the signs warn "Delays possible" - suggesting there could be a way through at times. 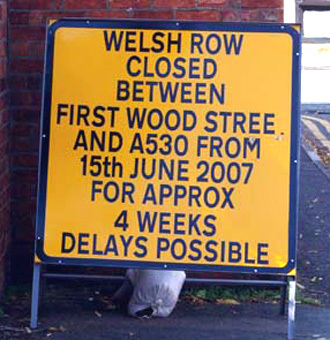 Also, it refers to Welsh Row as the affected road. That is correct, but how many people in an unfamiliar area would know the name of the roads they are travelling on? Even fairly local visitors. As for First Wood Street and A530 . . . a good map (and a good map reader) are needed to know exactly which roads are referred to. There must have been a better way to word the signs to be very clear - and stop motorists making an unnecessary trip in the wrong direction. Having turned right to drive along Welsh Row, motorists are getting almost up to the bridge before meeting a clear (red) "Road Closed" sign and having to turn round in roads off Welsh Row, or make a loop round the "three Wood Streets" - First, Second and Cross - in order to go back for quite a distance along Welsh Row before eventually turning right into the Waterlode inner ring road. to read them because of the vehicles in front. There is a third yellow sign in Welsh Row before the Marsh Lane junction, presumably intended to pick up people who didn't turn on to the Waterlode at the aqueduct junction (not its official name). For motorists approaching Nantwich from the Chester direction there are clear - and brief - signs diverting them on to the inner ring road, so they should not be among the drivers heading for the closure point. Drivers who reach the blockage and turn round, face a trip of half a mile or so back to the ring road, plus the length of the road itself, only to find themselves at the other side of the river bridge - yards from where they had been some minutes earlier. You might argue that motorists from the Wrenbury direction should know which road is referred to on the yellow signs, but when I go to Wrenbury, for instance, I am not aware of road names - just where I am going to. I don't suppose it is easy to be concise and precise, and produce a sign for all types of motorists (local and strangers), but a version of the red "Road Closed Ahead - Access Only" sign could have been used. Something like "Road Closed to Right . . . etc" or "No Through Road to Right". If they are not made, they should be! 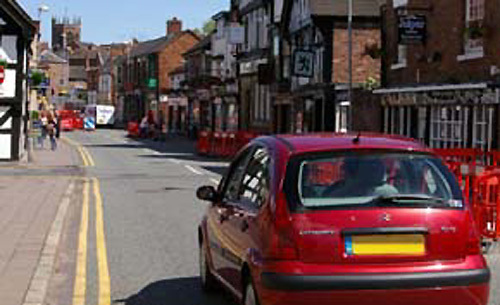 HERE is another signing problem - this time affecting pedestrians in Nantwich town centre. The single fingerpost arm says, in two lines: "Tourist Information Centre" and "St Mary's Church". 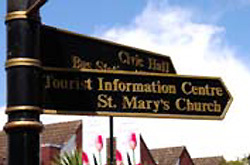 When the direction signs were first erected that was correct, but when the TIC moved from the town centre to the Civic Hall in Market Street the two buildings were in different directions. So what did the powers-that-be do? Leave the sign pointing towards the church (surely the more important building)? No, they turned it towards the TIC. I suppose that if you are a tourist you will find more information at the TIC - although St Mary's Visitor Centre volunteers are good, too. So now anyone wishing to see the church may find themselves on a long detour to get there. But the sign is at the bridge end of High Street and with any luck they may well have been to the church already. Let's be generous and say that was what the people who turned the sign had in mind. Council staff, that is. Unless it was all down to some unknown character (or characters) who has been having some fun (to them, anyway) lately altering the directions in which signs point . . . Very amusing.